One month ago I became a mother for the first time. It’s hard to believe that time has flown by so quickly. The days seem to have blended together into one big blur of deliriously sleepless nights and endless hours spent staring at my baby daughter. 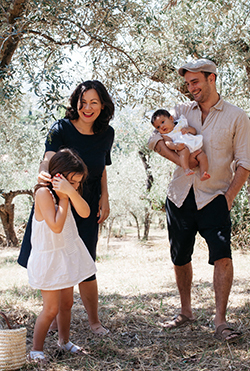 So many things have changed in a way that I couldn’t have predicted earlier, things that were easily taken for granted – feeding myself, for example, has taken a back seat to making sure the baby eats and sleeps and I can fit in a nap or three. Following the sage advice of books and friends, I had stocked our freezer with easy meals before the birth – something I am now so grateful for. But even so, I find I barely have time to defrost or heat or plate up some soup or ragu before the baby wakes (she seems to know to wake up at the most inopportune times). Meals often go cold and eaten hours later, or are hastily inhaled while balancing an infant on my lap. Even when Marco is home to cook (thank goodness I married a man who knows how to cook! ), we often have to take turns eating or I have to get him to cut my food into little bite sized pieces. Eating one handed is yet to be properly mastered – the laundry hamper is full of clothes with saucy stains. Simplicity is key. I’ve always been an advocate of simplicity, but now even more so. Meals, when I’m lucky enough to have time to make one (or even eat one!) have to be simple, quick, easy to eat and satisfying. I have to admit, making fresh pasta is a luxury for me these days, but Marco – my pasta man – will happily whip some up. 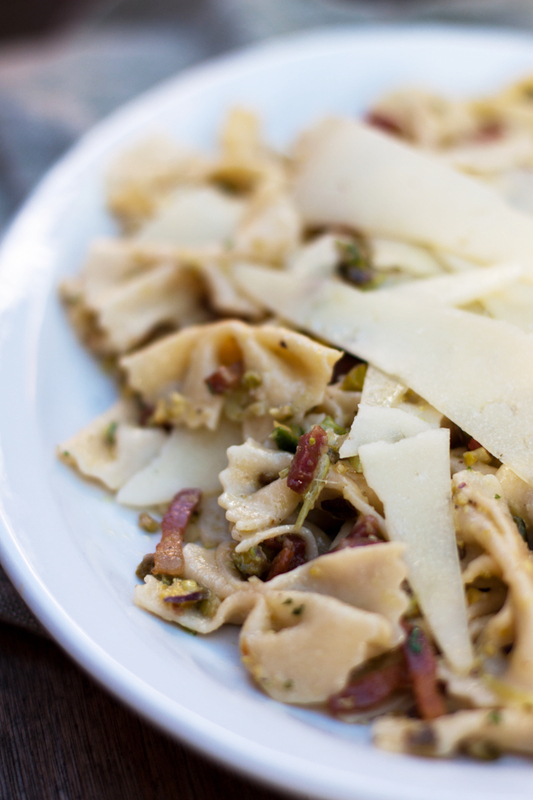 Dressed in the delicious, traditional combination of crispy pancetta, crunchy chopped pistachios and shaved cheese, this is a pasta dish that easily competes with tagliolini al limone in becoming a worthy household staple. If you wanted to make this recipe even easier, obviously you could go for a packet of pastascuitta (dried pasta), but then you’d miss out on making your own bowtie-shaped (or farfalle – butterflies, as the Italians call it) pasta, they’re not only pretty but really quite fun to make and unless you have a newborn baby, you really have no excuse not to make your own pasta with something as simple as this recipe! Farfalle pasta tend to hold their shape well when cooked so they are popular for using in pasta salads, but generally you’ll find them with a very simple sauce, usually vegetarian (tomato with fresh herbs or pesto), perhaps with fish but rarely with a rich meat sauce. This simple recipe is not so much a sauce as it is a coming together of flavours, colours and textures. The simplicity of this pasta dish means you can make a little bit more effort in making your own farfalle! Then again, if you’re short on time, this is a super quick dish to make with pastasciutta (the dry version). I’m leaving strict measurements out since this is the sort of dish that you can improvise with, throwing together the proportions that you feel suit you best – just don’t be skimpy with the pistachios! 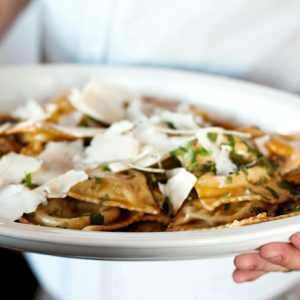 A note on fresh pasta: Cooking with fresh pasta is slightly different from cooking with dry pasta. Always add the pasta to the warm sauce, waiting patiently in the skillet. Keeping some of the pasta cooking water to loosen the sauce if necessary, toss it all together and serve. Make sure your guests are ready to eat and are sitting at the table when you throw the pasta in the pot – fresh pasta waits for no one! Saute the scallion in some olive oil over a low-medium heat to soften them. Add the pancetta and cook until the fat has rendered and, if too your liking, it becomes slightly crispy. Add the chopped pistachio and toss for a further 30 seconds or so. Take off the heat until your pasta is cooked (if you are using fresh pasta, it should take a couple of minutes only; if using dry, follow the recommendations on the packaging). When the pasta is ready, drain, reserving a little of the cooking water if needed. Add to the pancetta and pistachio, tossing with a little of the cooking water to create a sort of emulsion that binds the ‘dressing’ to the pasta. Garnish with chopped parsley and serve immediately with long shavings of cheese. For the pasta, sift the flour out onto a large, clean surface to make a ‘pyramid’ and then, with your hand, make a well in the centre of it. 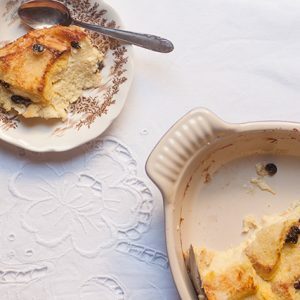 Crack your eggs into the well and with a fork, begin first by beating the eggs, then slowly incorporate the flour, little by little, until the mixture becomes creamy. Eventually you will reach a point where the mixture thickens so that you can no longer use the fork and have to use your hands. Incorporate the rest of the flour or as much as you need until it is no longer sticky. At this point, knead the dough for about 5 minutes or until it is elastic (poke it, it should bounce back), then wrap it in plastic wrap, or put an up-turned bowl over it and let it rest for 30 minutes. 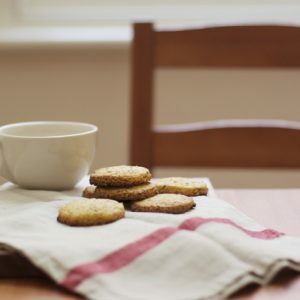 Dust a clean, flat surface such as your kitchen bench with flour. 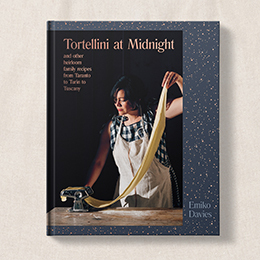 Roll out the dough (you may need to do cut it in half and do sections separately) and when it is thin enough to put it through a pasta machine, roll out and repeat until it is thin enough to see your fingers through it when you hold it up to the light (no. 7 on most pasta machines). If you are rolling by hand, which is more difficult due to the elasticity, roll from the centre out, until the pasta is thin enough to see your fingers through the other side. Cut into squares (use a frilled pastry cutter on two parallel sides if you want them to look traditional) and pinch in the middle to make the bowtie. Cook in a large pot of plenty of boiling, salted water for about 2 minutes (when tasting the pasta to check if it’s cooked, make sure you check the middle part of the bowtie where the pasta is the thickest!). Belated congratulations on becoming a mother Emiko! Also, the pasta sounds amazing. Just out of curiosity, is it a Tuscan dish? I’ve not had a Tuscan dish with pistachios in it before. Hi Louisa, thanks! No, actually this isn’t a Tuscan dish. The best pistachios come from Bronte, Sicily, so generally speaking traditional dishes that use pistachio would probably be Sicilian. 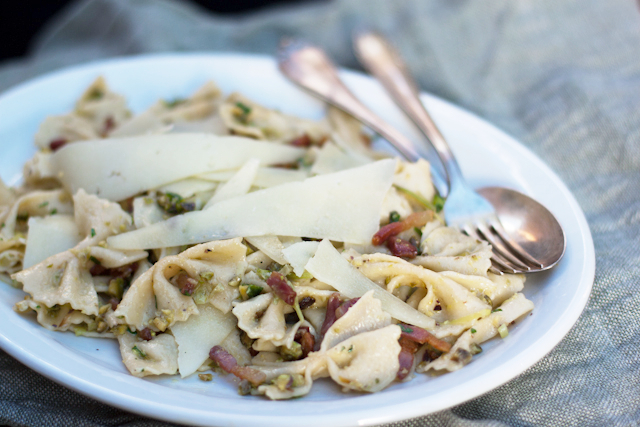 But this recipe has a bit of a pan-Italian flavour to it – Ideally, I’d use pistachios from Bronte, some Tuscan pancetta and the cheese shavings are inspired by a cheese from Lombardy in the north called Raspadura. A bit of a mix really! You know, I still have not tried my hand at fresh pasta! After taking a look at this recipe I know I really must try it. Also, I enjoy reading about your new life with the little one. What are you waiting for?! There’s something enormously satisfying about making your own pasta – these we actually rolled by hand but a pasta machine makes it a pretty easy process. Wish I had just a little bit more time to spend writing and cooking (and all those normal things!) now that there’s a little one demanding all my attention, but slowly we’re getting the hang of things! 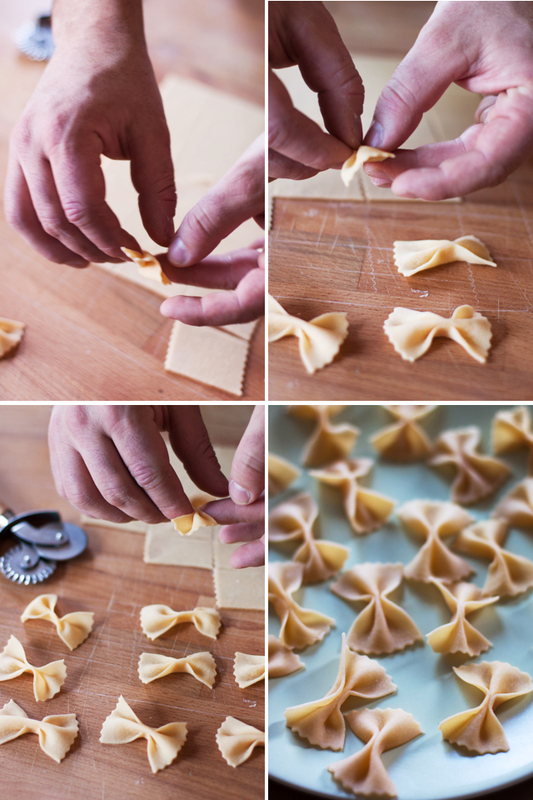 Oh, those homemade bowtie pasta are so pretty and perfect! They remind me of my childhood… A wonderful and comforting dish. Y do u call the paste ‘bowtie’ when Farfale means ‘butterfly’ in Italian?! 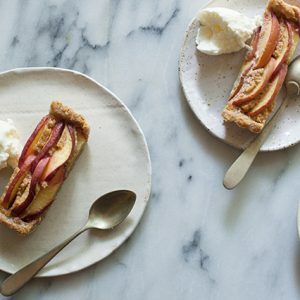 I love anything with pistachios in it, so this dish especially appeals to me. And even though I can’t lay claim to the title of new mother, I still like the sound of simplicity. Congratulations and best wishes settling into the rhythm of things! I just inhaled so much of this blog in one sitting. Wow. This is lovely. Good luck to you in these first months and I can’t wait to read more! Thanks, Mina (incidentally, we almost named our baby girl Mina, it was one of our favourite names!)! I’m so enjoying reading your blog too – thanks for stopping by so that I could find you! Congratulations on the birth of your baby girl! And how amazing to find time to make these beautiful farfalle I’ve just started making my own pasta again so will definitely have to try these. Thanks for this post Emiko. I honestly had never thought that farfalle pasta would be as simple as pinching the squares together. Silly me. My husband and I had a housemate how came complete with pasta machine. He’s moved out now, so we might need to invest in a new one – a machine that is, not another housemate. You’ve got to have a pasta machine. I mean, rolling by hand is ok too but having a machine makes it just so easy!